Congratulations on your decision to get married. We are happy that you might exchange your vows in our church. 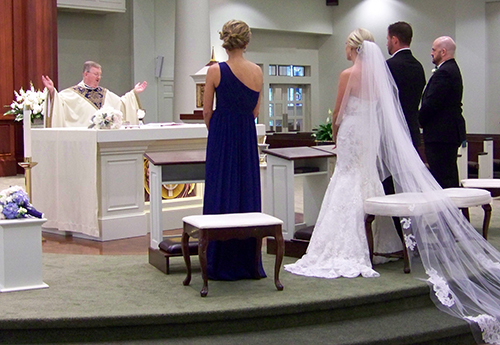 Weddings are special, joyful times for couples, for their families and friends and for the parish community. The Church welcomes you to celebrate your marriage in a situation in which you are accustomed to praying as Catholics. For us as believing Catholics, matrimony is a sacrament, a visible sign of God’s invisible blessings and of the Lord’s presence in our lives. Great care is taken to see that the prayers for this special moment are reverent, graceful and open to the movement of God’s spirit among us. When the sacraments, including marriage, are celebrated, an important place is given to listening to the Scriptures so that we can be nourished and strengthened by God’s Word. We celebrate the sacraments as a community and invite our brothers and sisters in faith to join us and ask for their prayerful support. The presence of our relatives and friends allows us to celebrate with joy and thanksgiving. Since we are celebrating the Sacrament of Matrimony and not simply having a wedding, The Parish of Christ the King provides the following guidelines for celebrating this special moment in your lives. 1. It is presumed that the bride or groom normally is a member of The Parish of Christ the King and that the Catholic party(ies) are practicing the faith, i.e., going to Mass each week. 2. 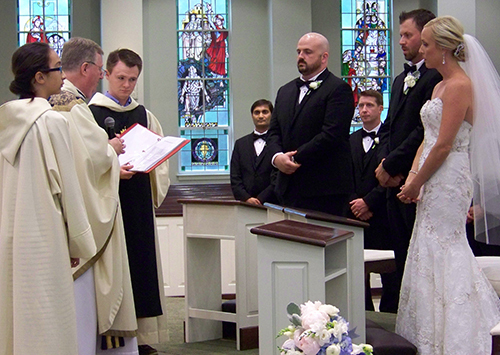 The Guidelines for the Diocese of Fall River regarding marriage clearly state that those wishing to marry should notify the parish priest at least eight months before the wedding date. deacon to fill out the necessary forms and to make preparations for the actual celebration itself. 4. 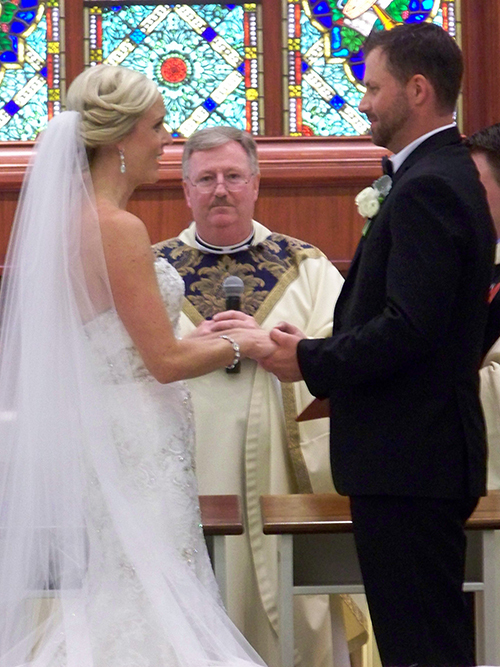 The couple will be required to take part in the Marriage Preparation Program of the Diocese of Fall River or a similar program in their own diocese as part of their preparation for marriage. For the Diocese of Fall River, the program information can be found on the following website Diocese of Fall River: Marriage Preparation. 5. There are many couples who are not members of our parish or diocese. We are happy to accommodate those couples when possible. A letter of permission from one of the pastors of the couple other than our own must be presented when the papers are filled out. 6. A recent Baptismal record for the Catholic party(ies) must be brought to the first consultation with the priest or deacon. The record must not be more than six months old and can be obtained from the parish in which the Sacrament took place. A copy of a Confirmation Certificate is also required. This does not need to be recent. Non-Catholics who are baptized are also asked to bring a copy of their baptismal or christening record. 7. Please bring a “snapshot” or photo of the couple to the first consultation. Write the names and marriage date on the back. It is suggested that you arrange for your music ministers soon after you have met with the parish priest. Our parish has fine musicians available to you and a list will be given to you at the first consultation. You may request that the music is provided by musicians, not of our parish. In this latter case, your musicians are to contact the Director of Music for consultation as to the order of the ceremony and the music chosen. Music selections must be made according to the Diocesan Guidelines which simply put are to be “Church music in church and non-church music elsewhere.” All financial arrangements between yourselves and the music minister(s) are to be handled directly and not through the arranging priest. Weddings are scheduled on Saturdays at 10 or 11 AM and 12 Noon or 1 PM but always two hours apart. A Saturday evening wedding at 5:30 PM can be arranged. Sunday weddings can be arranged at 2 PM. Friday Weddings can be arranged at 4:00 PM. 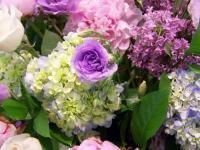 You may wish to provide flowers for the sanctuary for your wedding. We have an ample supply of containers and a variety of pedestals, etc. Your florist should come to pick up the inserts or containers in advance of the wedding. The flowers provided for the sanctuary are a gift to the church and are not to be removed to be used at the reception or dinner. If there is more than one wedding on a given day, you will be given the name of the other party so that you can coordinate the arranging of flowers, thereby eliminating unnecessary expense and duplicity of floral arrangements. A “runner” for the church is not allowed. Bows, etc., on the pew ends, are allowed but must be fastened by ribbon only; not clamps, sticky stuff, etc., only ribbon. Most couples like to have a remembrance of their wedding ceremony. However, we make every effort to make sure that your wedding ceremony is in every way possible a spiritual expression of faith. To that end, a separate sheet details the policy to be followed by photographers and videographers. Please duplicate this as needed and give to the persons you are using. SEE below for our Live Streaming option. We would ask that you kindly inform your guests to refrain from throwing rice or anything else. There is no necessity of having a wedding or unity candles. They are not part of the official Catholic Rite. Their use is discouraged. If you have a relative or a close friend who is a priest or deacon and you would like to invite him to witness your marriage, you are most welcomed to do so. Please discuss this with the parish priest so that the necessary permissions, both legal and ecclesiastical, can be obtained. If one of the parties is a member of a Protestant Church, his or her minister is most welcomed to be a participant in the wedding ceremony. Particulars can be worked out with the priest arranging the wedding ceremony. It is customary to give a free-will offering to the parish on the occasion of the celebration of a marriage. We have no set fee for parishioners. Please give what you can afford. When neither of the parties is from Christ the King, it is suggested the offering be a minimum of $500. If circumstances are such that you cannot afford this, please consult the pastor. The free-will offering does not go to the Celebrant. If you wish to give him something, please do so in a separate envelope. This is completely optional. “License”… you must obtain a license in Massachusetts within 60 days of your wedding celebration. The license goes into this envelope. “Selection Form” …you will be given a booklet with all of the options for your wedding ceremony, i.e. readings, prayers, etc. The back of the booklet has a pull-out form called, “selection form.” After carefully making your selections, fill out the form and place it in this envelope. “The Parish of Christ the King”… this is the envelope for the offering to the church. “Altar Server”…these two envelopes are provided when you are having a Mass. We provide the altar servers. A customary tip of $20.00 dollars cash for each server is sufficient. “Gift to Celebrant” …if you wish to give something to the celebrant, please use this envelope. Christ the King is now live streaming all our masses and with that comes the option to live stream your wedding. You can check this out by clicking “Live Stream”. 1. We do not want the camera on during our wedding. at the time of your wedding. This is a set shot of the sanctuary only with no camera movement. 3. We want the live stream on and the camera operated by a person. The fee is $175.00. This will be recorded and uploaded to our YouTube page for future viewings and/or you may provide a USB stick and the file will be saved to that for your keeping. A form for “Live Streaming” is enclosed in your information packet. *If for some reason there are technical difficulties beyond our control and the webcam is “down” any fees paid will be returned. Sorry for any inconvenience. The Friday evening prior to your wedding will be assigned to you. Friday afternoon weddings have a rehearsal scheduled on Thursday, the evening before. Please be on time in consideration of both the coordinators and the other wedding parties for that particular weekend. Our wedding coordinators will conduct the rehearsal and be present for your wedding. 1. The traditional procession: Ushers as a group, two by two; bridesmaids in single file; ring bearer and flower girl; maid of honor; the bride with father. 2. The family procession: Ushers and bridesmaids two by two; flower girl and ring bearer; best man and maid of honor; groom with parents; the bride with parents. Note: Little children, i.e. under the age of five, are discouraged from being in the wedding procession. We’d like to CONGRATULATE you on your upcoming marriage. Please remember the sacredness of marriage. Besides being a very meaningful social occasion for you and your families it is a profoundly sacred happening, as you are receiving the Sacrament of Matrimony. By your marriage in the Church, you are making a public statement of your faith and your fidelity to each other and to Christ, within the community of the Church. Please take this time before marriage to prepare yourselves for life together, as married people of the Church spiritually. 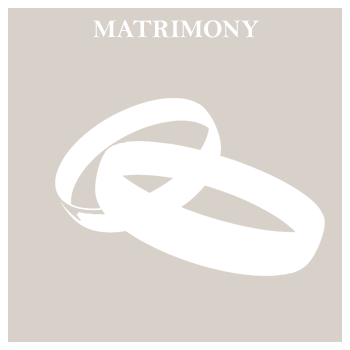 You will be given a copy of your certificate of marriage at the time of your wedding. Should you need additional copies in the future, they will be available at The Parish of Christ the King. Register in your parish as soon as possible after the wedding. You are now a new family and it will be your responsibility to register in the parish where you will be living whether this is Christ the King or some parish elsewhere.